Taking it back to a more classic and simple design, Panenka’s “Thermal Imager” is an old-school “thermal” style burner but with high quality results by today’s standards. It is reliable in both performance and safety with features like a manual feed switch and automatic overheat protection, also making this machine easy to maintain and keep jam-free. 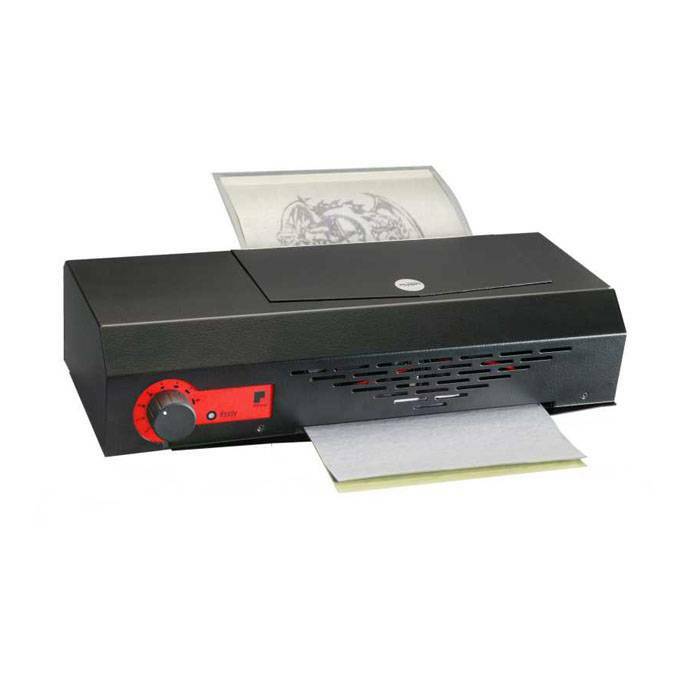 Thi stencil image copier has a 1350 watt output and is compatible with a 20 amp fuse. The maximum carrier width is 9.25”. Clear carriers are recommended for use with Panenka thermal machines; please see below for a list of accessories and replacement pieces. The Thermal Imager is engineered and manufactured in Germany. German Thermal Imagers will only transfer from carbon toner copies (copiers and laser printers); please use carbon-based copies as this will provide the best results. Standard inkjet/CMYK printers will not work since it is not carbon-based, Modern inkjet printers, such as the Canon Pixma models, contain a pigmented cartridge that is compatible with the Panenka Thermal Imager. Please view the gallery of images for an example of a standard ink copy next to a pigment copy, as well as a comparison of the Spirit Classic Purple and the Green stencil paper (on right). The Green paper shows better results on the same speed-setting.